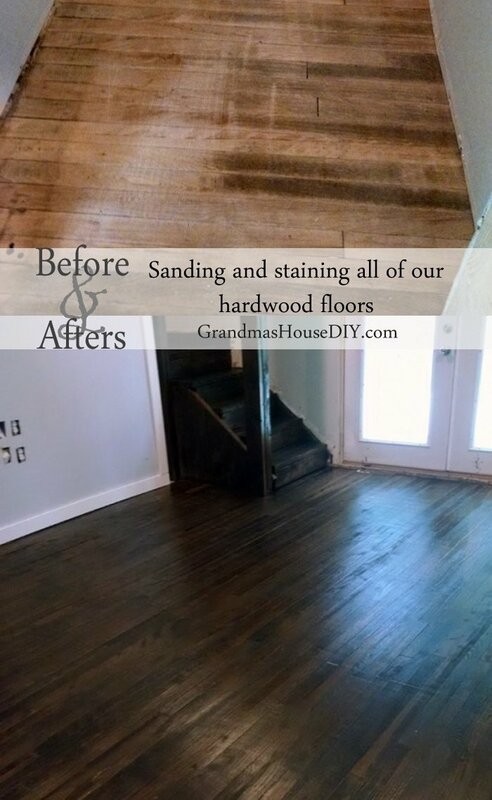 Sanding and staining hardwood floors is not for the faint of heart! Flashing back to July of 2015 and it was time to get those floors done. Joe (my now ex husband) and I rented a drum sander and I bought a bag full of extra sand paper for my little electric palm sander. This was literally the day after we finished all of the painting throughout. We had no idea the arduousness of the the task we were about to tackle. 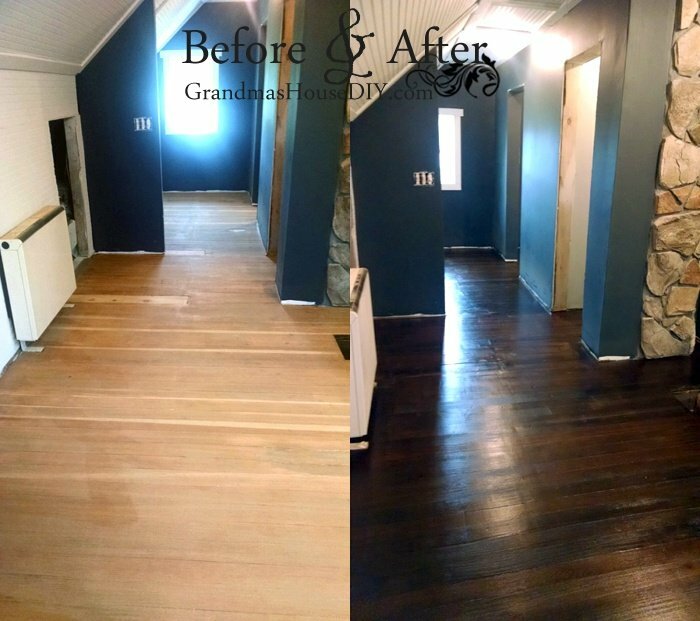 I had already had the brilliant idea of doing none of my base or door trim until after we finished the floors and thank the universe we waited to finish the trim. To say the least stain is messy and splashy and eventually got everywhere… mostly on me. 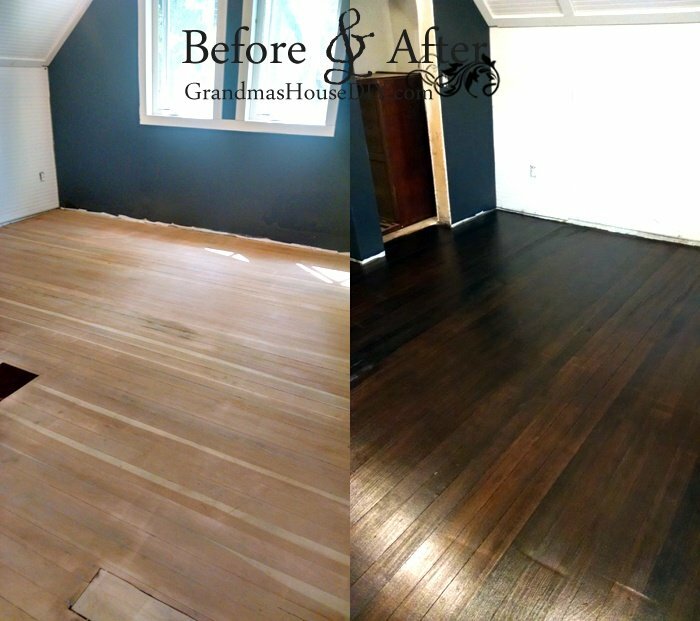 We were very excited when we started because we were absolutely in love with my hardwood floors. 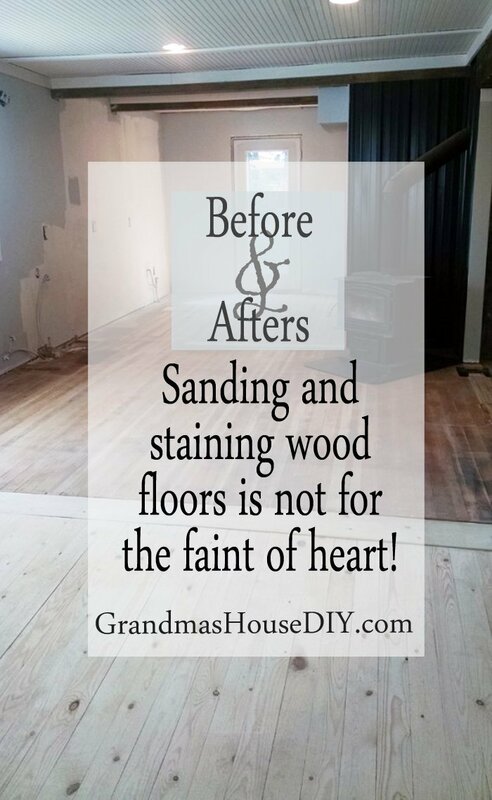 To say the least sanding 1,500 square feet of hardwood flooring and then staining it and sealing it is not at all for the faint of heart! 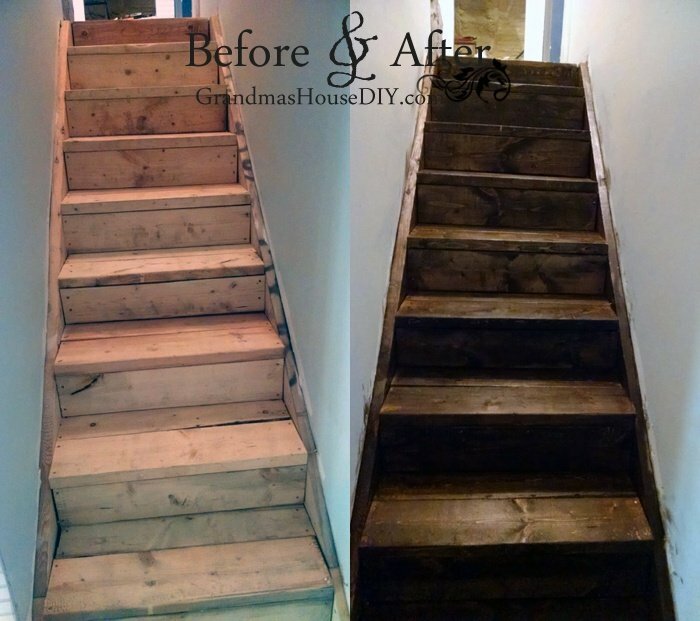 It took Joe and I an entire day, over eight hours, to get every last inch sanded down, where the drum sander wouldn’t reach (all around every room) and where it wouldn’t fit (the bathrooms) I had to do by hand, on my hands and knees, with my little electrical sander. It went into a four day weekend where I tackled the staining. This, like a couple of the other jobs, was something I had experience doing so I took it on as my own project so the majority of it I did alone with a big brush and a whole pile of old t-shirts and towels. Just look at me, for two days this is what I looked like and only acetone would get it off my hands. I used Dark walnut stain by Minwax to do it all. I would cover as much as I could in fifteen minutes then go back and wipe up the excess over and over and over and over again until I finally stained myself backwards, right out the front door. I left the house for two days then, no walking on the hardwood floors! Then I came back and did three coats of a poly acrylic which I rolled on. You can see why I was SO glad I hadn’t done my white base trim or door trim yet! Near the end there with my poor back and knees just screaming I will admit I was definitely not as careful as I could have been. Splashes with stain happen all the time and it is almost impossible to avoid it! To this day I notice a spot or two along one of my walls, drives me crazy but the majority I covered with a little touch up paint, no problem. 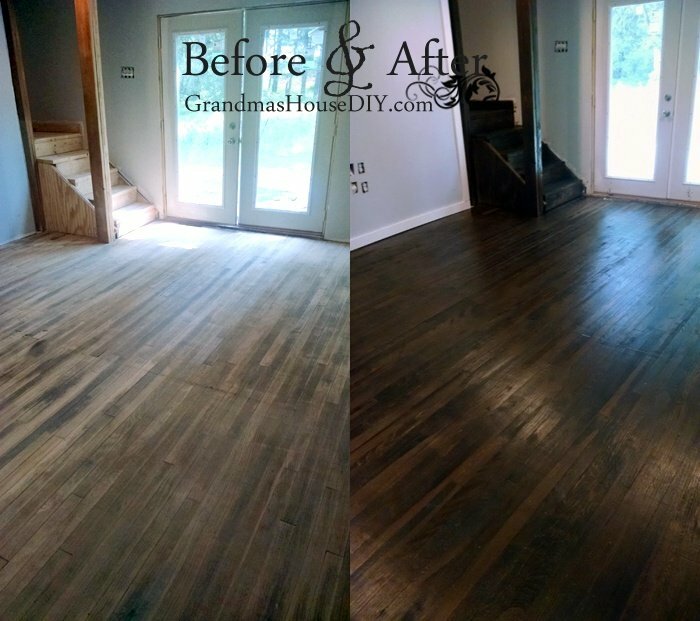 I have been asked before why I chose such a dark wood stain and, don’t get me wrong, you can see some of the floors in the pictures were absolutely gorgeous and it did hurt me a bit to stain them at all. 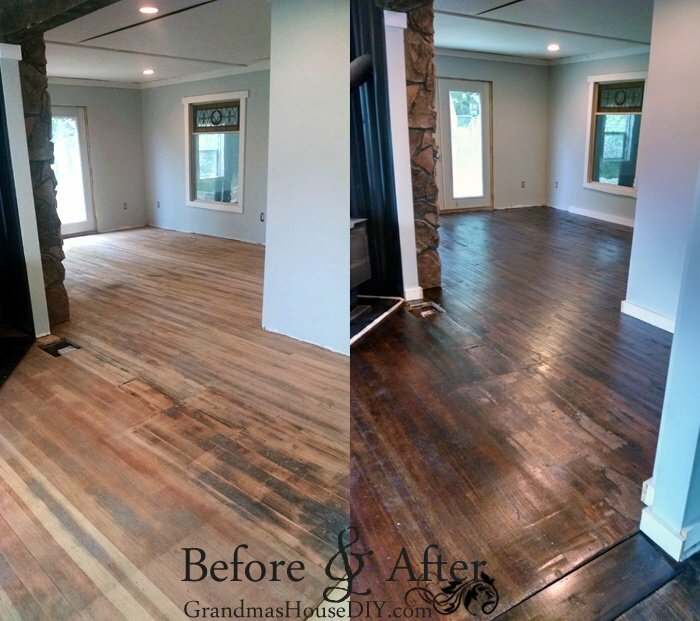 However, not all of the floors throughout the house were in very good shape, they were stained, patched and had definitely seen better days. 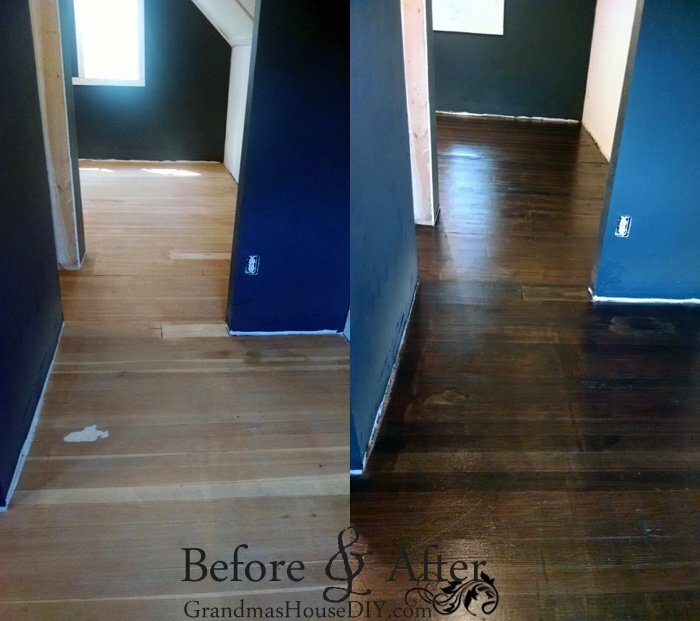 And, I knew that dark stain would make all of the hardwood floors throughout the house become cohesive and it would help hide any patches or stains so, I went with the dark. 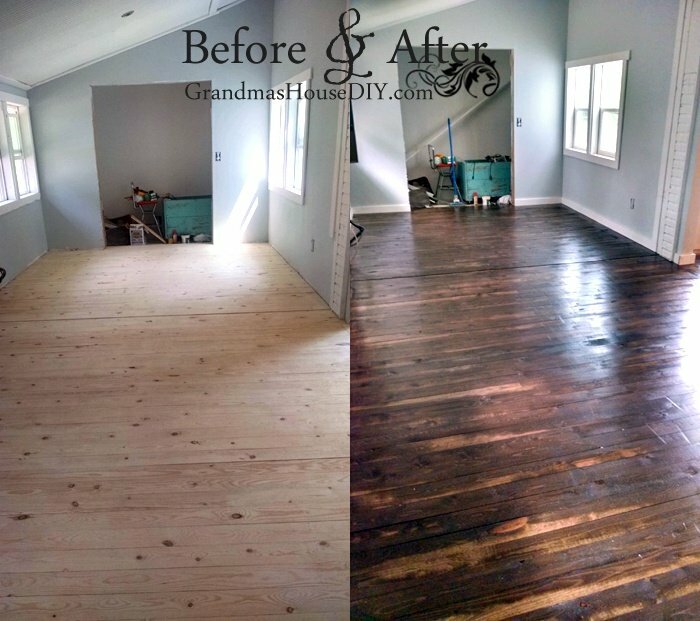 You can see that using the dark stain literally made all of my floors look like the same kind of wood. In the staircase pictures its REALLY obvious. 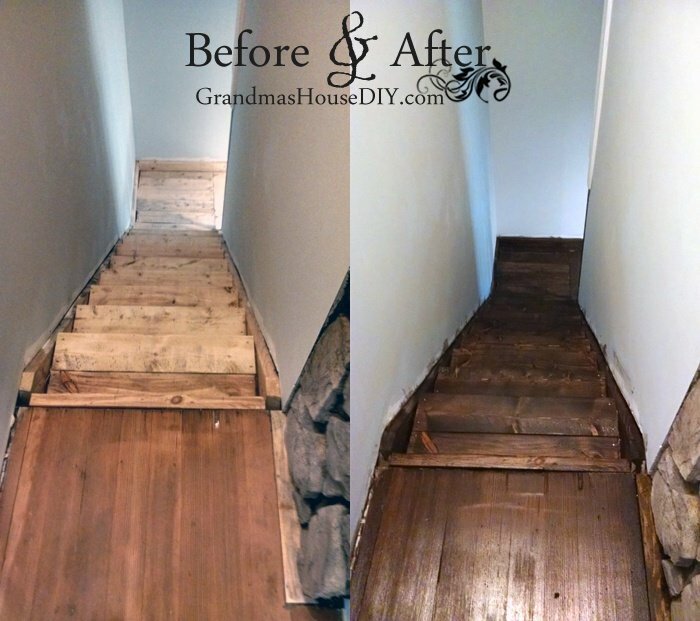 Upstairs and downstairs is the 100 year old hardwood floors and the staircase was built with nothing but basic builder’s pine 2x6s that I picked up at Menards. Now, all stained, they look great side by side. And, in fact, I’ve received so many compliments on my staircase I can hardly believable it! So, how do I like living with dark hardwood floors? 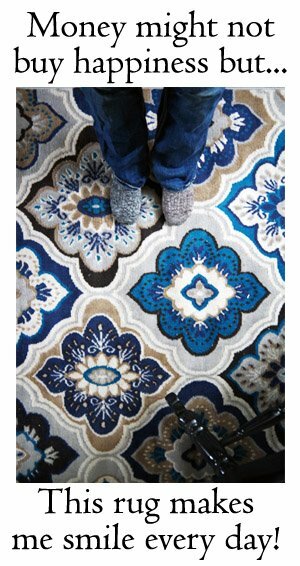 Well, let me start by saying that no matter what happens I love them and I would never EVER go back to carpet or tile. I really truly do love them. Now, with that being said, they show EVERYTHING. Sweeping has become a daily chore and the fact that I burn wood in my kitchen to heat my entire house between the sawdust and everything else, well, its just something I’m learning to deal with. They look filthy about 80% of the time and that’s just the way it is. I don’t take my shoes off, the dog doesn’t take his shoes off, they look dirty A LOT. I’ve learned now why people put rugs by their beds because if I don’t wipe my feet off before climbing into bed I bring in a sand box with me. I bought a little hardwood floor vacuum on amazon for $90 and it lasted about a month here, the wood chips and sawdust off of the wood I haul in on a weekly basis just killed it. I’m planning on getting us a big dust mop eventually and maybe trying out a different hardwood floor vacuum as well a swiffer. I think all of those things could really help the situation but the fact remains my floors are a flat dark surface, they will always show every spec of dirt, dust or dog hair or anything else and there’s really nothing I can do about that. 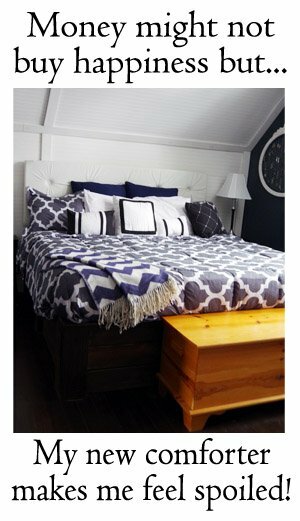 In spite of it though, I would never go back to a different type of flooring. 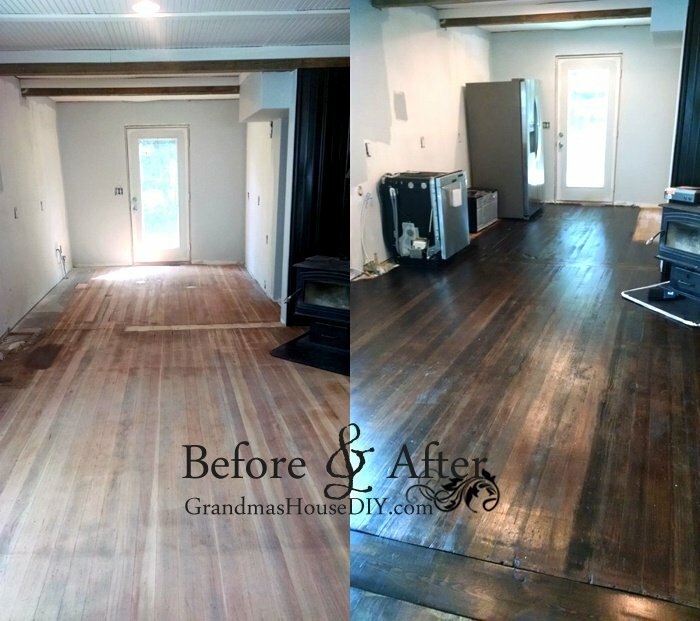 This floor is RUGGED, its tough, any dents or scrapes I may create really just add to the already 100 years worth of character. 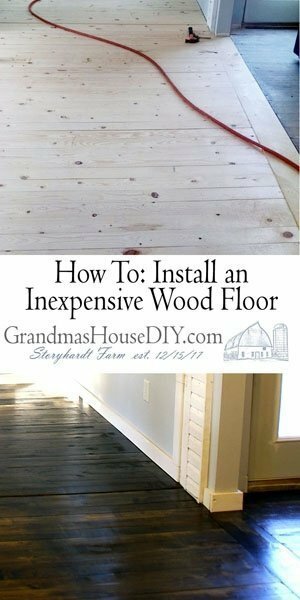 That, of course, is just not true of all wood floors but it is true with mine and that’s exactly why I wanted to keep the old hardwoods. The truth is I had more then one person suggest I cover them up with “new” flooring and I just laughed. Nope. The wood floor was already here what kind of person would I be to cover it up with something I would deem inferior? Forget it! On top of that, because it isn’t perfect, Joe and I do not spend my days trying to baby it. In my opinion floors were meant to be danced on not babied over! If you look around the area for Shop Vacs they have a small portable one. This is what I use one my 115 year old wood floors. (It get the dust bunnies out of the cracks). This can get the chips and the grit. And they run about $30.00 to $40.00. And they can do wet or dry! Thanks Sheila! We have a big shop vac that we’ve been using but I never thought about getting a smaller one, that’s a great idea! The big one is just a pain to use on the whole house but a smaller one might just do the trick. Thanks! 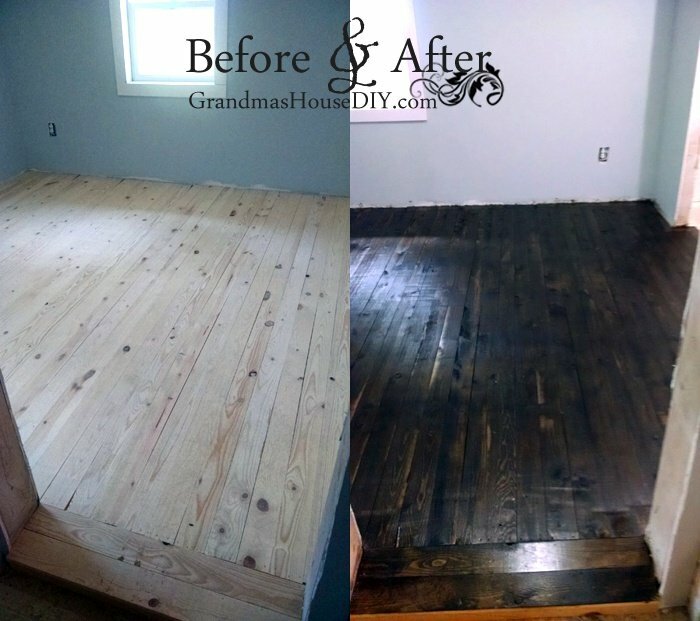 Hi, Love the dark wood floors and appreciate all the work you have put into your Gma’s house. I would suggest an old fashioned dust mop for daily sweeping of the floors or buy a more expensive small vacuum with a way to easily empty. There are several on the market. Good luck in your endeavors. 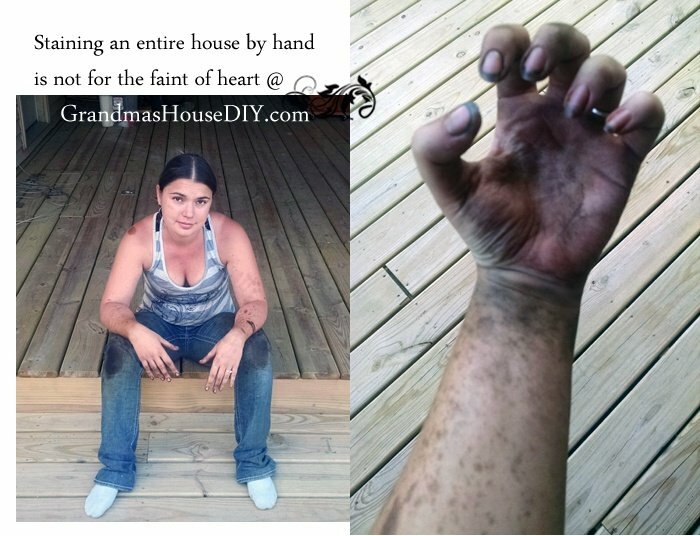 After all the sanding, staining, removing old paint you will be like me and not have readily identifiable fingerprints. I’m a nurse and at work have had to be fingerprinted several times and I just have swirls and no regular fingerprints. I just have to use my name & password to sign in at work. Lol. None of the quick swipe of the finger to get into things. Adrienne, thank you so much for coming by and commenting! 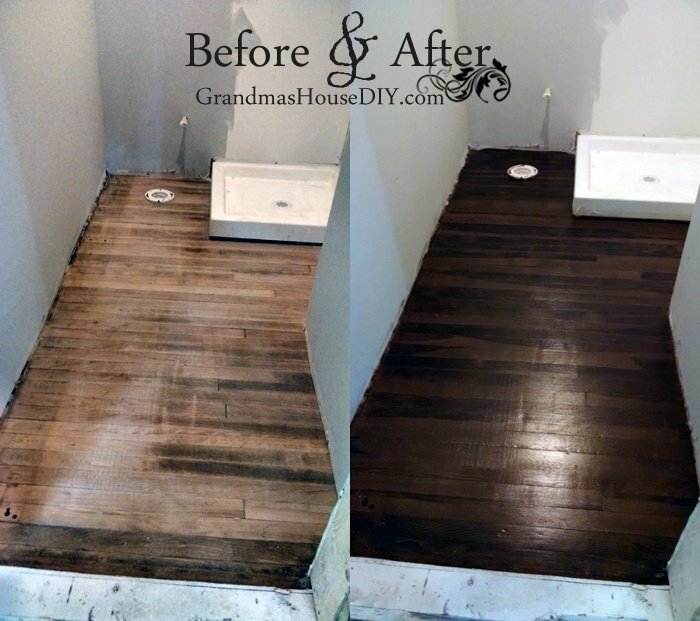 Yes, trying to keep the wood floors “clean” has definitely been a learning curve! We did get ourselves a big dust mop (just like you suggested) and our lives improved dramatically, so much better then sweeping with a broom. Lol, I’m looking at my finger tips right now and they have definitely seen better days! lol thank you so much Helen!